Holyhead ( i/ˈhɒlɪhɛd/ HOL-i-hed; Welsh: Caergybi [kɑːɨrˈɡəbi], "Cybi's fort") is the largest town in the county of Isle of Anglesey in Wales. It is also a community and a major Irish Sea port, serving Ireland. Despite being the largest town in the county, with a population of 11,431 at the 2011 census, it is neither the county town nor actually on the island of Anglesey. 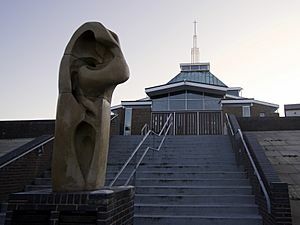 Holyhead is located on Holy Island, which has a population of 13,659 at the 2011 census. It was originally connected to Anglesey via Four Mile Bridge, so called because the bridge was four miles (6 km) from Holyhead on the old turnpike Road. In the mid 19th century, Lord Stanley, a local philanthropist, funded the building of a larger causeway, known locally as "The Cobb", it now carries the A5 and the railway line. The A55 dual carriageway runs parallel to the Cobb on a modern causeway. The town centre is built around St. Cybi's Church, which is built inside one of Europe's few three-walled Roman forts (the fourth boundary being the sea, which used to come up to the fort). The Romans also built a watchtower on the top of Holyhead Mountain inside Mynydd y Twr, a prehistoric hillfort. Settlements in the area date from prehistoric times, with circular huts, burial chambers and standing stones featuring in the highest concentration in Britain. The current lighthouse is on South Stack on the other side of Holyhead Mountain and is open to the public. The post road built by Thomas Telford from London strengthened Holyhead's position as the port from which the Royal Mail was dispatched to and from Dublin on the Mail coach. The A5 terminates at Admiralty Arch (1822–24), which was designed by Thomas Harrison to commemorate a visit by King George IV in 1821 en route to Ireland and marks the zenith of Irish Mail coach operations. Holyhead is the terminus of the North Wales Coast Line and is currently served by Virgin Trains and Arriva Trains Wales services. Virgin Trains run direct trains to London Euston and Arriva Trains Wales operate direct trains towards Cardiff and Birmingham International via Wrexham and Shrewsbury, and two direct trains per day to Manchester Piccadilly. The rail and ferry terminals are connected (for pedestrians and cyclists) to the town centre by The Celtic Gateway bridge. 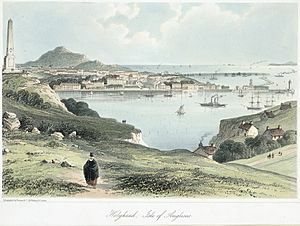 Holyhead hosted the National Eisteddfod in 1927. Holyhead is the start and finish point of the Anglesey Coastal Path. 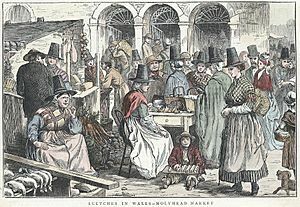 According to the United Kingdom Census 2001, 47% of the residents in the town can speak Welsh. The highest percentage of speakers is the 15-year-old age group, of whom 66% can speak the language. According to the 2011 Census, of those in the community who were born in Wales, only 52.2% of the population could speak Welsh. The town's main football team is called Holyhead Hotspur and they play in the Cymru Alliance , with their reserves playing in the Gwynedd League. There is also Holyhead Gwelfor Athletic who play in the Anglesey League. Holyhead Facts for Kids. Kiddle Encyclopedia.